Our World War I museum has been often consulted by foreign groups travelling through Italy First World War battlefields. They are usually looking for advices on locations, starting points for excursions and logistics aspects to better organize their trip schedule. We are more than happy to give advices for free. For this reason, we believe that we could even share with the kind visitors of WWI Bridges our suggestions. Each post of the unit tagged as Itineraries will correspond to a one day trip proposal, so that everyone will be able to assemble and disassemble these suggestions to prepare a "more than a day schedule". Of course these are intended to be only suggestions, and you should always take into consideration the travel variables. If you're not already staying in the Dolomites, first reach Cortina d’Ampezzo. From there you can rise up to Passo Falzarego (2100 m / 6888 ft a.s.l.). You may take the cableway from Passo Falzarego to the summit of Monte Lagazuoi (2770 m / 9085 ft a.s.l.) and visit the Austro-Hungarian first lines, trenches, positions and shelters. From that spot breathe the view of the entire mountain war front (Marmolada, Monte Piana, Tofane). You may have lunch at Rifugio Lagazuoi. 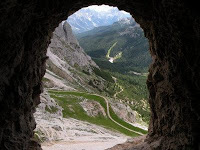 OPTION A (level-EASY): cableway back to Passo Falzarego and drive to Forte Tre Sassi (Valparola pass); a visit of the museum that has been laid out starting from the Austrian fort could follow. After that, and according to the weather conditions, you may take into consideration to visit the first lines at Sass De Stria or the Austrian barracks opposite to the Austrian fort. OPTION B (level-MEDIUM DIFFICULT): walking down from Cima del Lagazuoi to "Galleria di mina italiana" on a path that goes through a cave. Time: 2 h 30’ / 3 h. After that, departure from Forte Tre Sassi and way back to your place. Requirements for option B are of course a good physical shape, good training and all the equipment that is usually needed for trekking and hiking (boots, helmets, torch etc).